The Bulldogs still have a shot at CBC title with one league game left, against Weston-McEwen on Saturday. 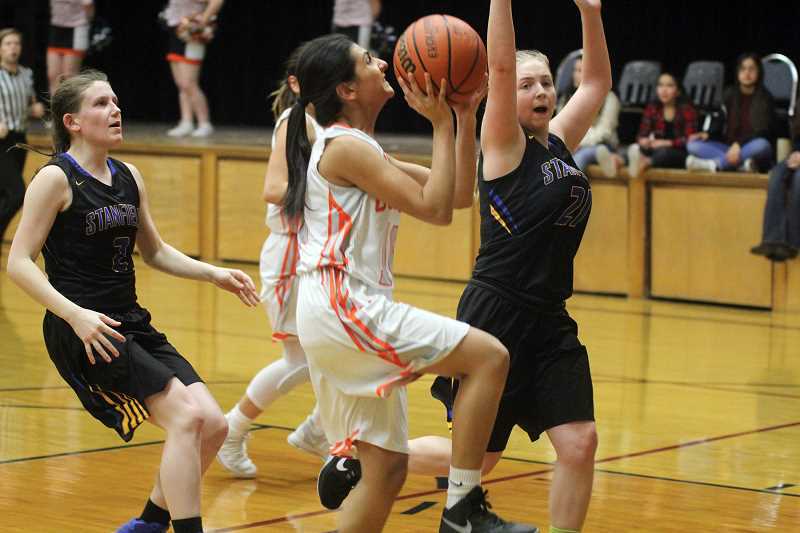 The Columbia Basin Conference girls basketball hierarchy got a lot more interesting over the weekend. A combination of Culver winning both of its games, against Stanfield Friday and at Heppner Saturday, plus Pilot Rock knocking off league leader Weston-McEwen, has created an outside chance that the Bulldogs could win the league title. Culver pushed its win streak to three games after beating Heppner 40-29 on Saturday. The two teams had identical 4-2 league records going into Saturday's game, but because Heppner had already beaten Culver once this season, the Bulldogs needed to return the favor if they wanted to climb the standings. Behind 17 points from Irma Retano, plus an additonal 11 from Elly Bautista, Culver took a seven-point lead into halftime. 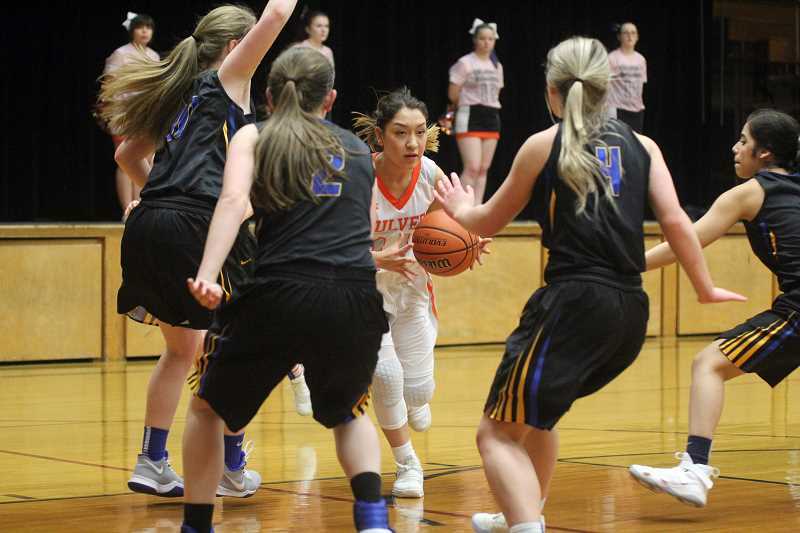 Heppner cut the deficit to one point in the third quarter, but the Bulldogs separated themselves in the fourth quarter to complete the double-digit win. 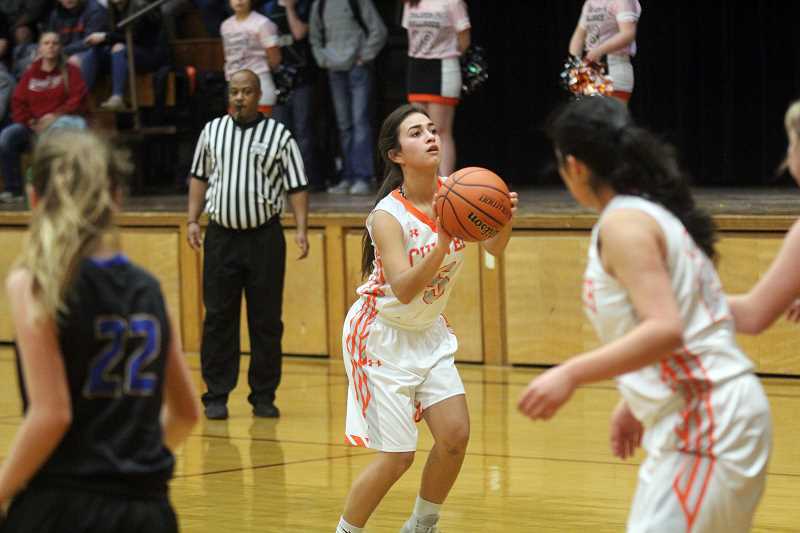 At her coach's urging, Mia Gamboa let it fly from 3-point range. Although Culver looked a tad unsure of itself in the opening minutes of Friday's home game against Stanfield, the Bulldogs sprinted out to a big lead by the quarter's end, with a big boost from their junior point guard. The Bulldogs' run started with one minute, 16 seconds remaining in the quarter, when Gamboa drove down the lane and banked in a layup. Culver then forced a steal, and found Gamboa open for a 3-pointer. She hit another deep ball with 48 seconds left, and her third of the quarter, as the buzzer sounded, while also getting fouled. She somersaulted, rose to her feet, and after teammates embraced her with a handful of high-fives, she converted the four-point play from the foul line. The Bulldogs held an 18-2 edge after one quarter, setting the tone for a complete, four-quarter effort and eventual 53-19 win. Culver improved its Columbia Basin Conference record to 4-2, and more importantly, clinched a spot in the CBC District Tournament, where the top two teams will qualify for the playoffs. In the league hierarchy, Stanfield's 2-19 overall, 0-6 league record is last, but the win was significant for the Bulldogs, because of the postseason implications, and also, the display of inside-out potential they showed with their buckets coming from a variety of spots on the floor. "That totally changes our team if you've got Mia sitting out there hitting two or three 3s," Culver head coach Scott Fritz said. "Tonight, she was lights out." Though Culver doesn't typically take a lot of deep shots, the team has three legitimate threats in Gamboa, Rosi Olivera and Bautista. In the last couple of weeks, Gamboa, in particular, has looked more aggressive in her outside shot selection. Culver first-year assistant coach Kaylee Peck was watching film of last year's CBC District Tournament game between Culver and Weston-McEwen, and noticed something conspicuously different about Gamboa's game: she was attempting 3-pointers much more regularly than she had been during the current season. Peck texted Gamboa, urging her to trust herself in taking those shots. "The whole season, I haven't really been aggressive shooting outside, so they told me, 'You have to look for your shot,'" Gamboa said. Culver was equally deadly in transition, forcing 19 steals that led to numerous fastbreak scores. Retano also reached double figures with 14 points, while five other players made at least one field goal. The Bulldogs' CBC finale on Saturday against Weston-McEwen could decide a league champion. The TigerScots (5-1) are a half game up on the Bulldogs (5-2), but will play Stanfield the night before Saturday's game at Culver. Culver would have to beat Weston-McEwen in order to win the league title.